Revisit the beneficiaries listed in your will. Your last will and testament may include your ex-spouse, stepchildren, in-laws, or others as beneficiaries, but the divorce could have changed your opinion about who should receive your assets. To change beneficiaries or otherwise alter your requests, you’ll need to create a new will. Have it signed and dated by two disinterested witnesses, just as you did with your former will. Getting your new will notarized isn’t required by law, but it can make the probate process faster for your beneficiaries, so you should strongly consider visiting a notary for this.You will also need to revoke your old will. Though the most recently signed and dated version will take precedence, physically destroying your old will help ensure that your most recent wishes are respected. Update your personal representative. 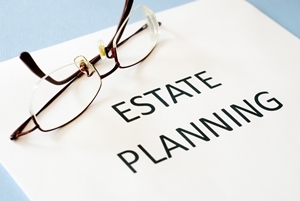 You may have appointed your ex-spouse as personal representative (sometimes called an executor) to your estate. If you do not wish this task to fall to your former spouse after the divorce, be sure to name someone else to handle your estate’s affairs when you’re gone. Update your child’s appointed guardians. If you are survived by children under 18, guardianship usually will shift to the other parent, unless that parent is also deceased or otherwise legally unavailable. However, you can still make your wishes known in the event that both parents should die. Update your living trust. If you have established a revocable living trust as a part of your estate plan, make sure that it still names an appropriate trustee to handle your affairs, especially if you appointed your former spouse. Update other beneficiary arrangements. You may have other assets with beneficiary arrangements outside of your will, including life insurance, retirement accounts such as an IRA or a 401(k) plan, transfer-on-death brokerage accounts, or payable-on-death bank accounts. To change beneficiaries of these types of assets, you’ll need to contact the employers, banks, brokerages, or investment companies that manage them to request the appropriate paperwork. Update your advance directive and power of attorney. A solid estate plan should include two kinds of advance directives: a living will and a durable power of attorney for health care. The living will states your wishes for medical care should you become unable to make decisions for yourself. The durable power of attorney for health care names who will be responsible for your health care in situations that are not covered by your living will. While your living will may not change now, you may wish to name a new party for your power of attorney for health care, so your ex-spouse is no longer responsible. Finally, you should consider your durable power of attorney for finances. This document names a trusted person to handle your financial matters should you become incapacitated. If you named your ex-spouse and no longer wish for her to take on this responsibility, now is the time to name somebody else. These steps cover updates to many common estate plans, but yours may be different depending on your specific needs. It’s advisable to make a checklist to be sure you have made the appropriate changes to all of your legal documents. Keep it with your estate plan to make your next review go smoothly. If you’re unsure about making changes or would just like some legal help making sure that your plan fully protects your future and your family’s future, an experienced attorney can help you. The Law Offices of Molly B. Kenny offers a wide range of estate planning services, including wills, living wills, trusts, and powers of attorney. We have over 24 years of experience helping a diverse range of clients with their family law and estate needs. Call us at (425) 460-0550 to schedule a consultation in our Bellevue offices.